Olive oil is a fruit oil obtained from the olive (Olea europaea; family Oleaceae), a traditional tree crop of the Mediterranean Basin. The wild olive tree originated in Asia Minor , (modern day Turkey ), and spread from there as far as southern Africa, Australia, Japan and China . It is commonly used in cooking, cosmetics, pharmaceuticals, and soaps and as a fuel for traditional oil lamps. Olive oil is used throughout the world, but especially in the Mediterranean. World production in 2006/7 was 2.767 million tonnes, of which Spain contributed 40% to 45%. In 2006, Turkey accounted for about 5% of world production, similar to the Spanish province of Jaén , well known for the biggest olive groves in the world. Of the European production, 93% comes from Spain , Italy and Greece . Greece devotes 60% of its cultivated land to olive growing. It is the world's top producer of black olives and has more varieties of olives than any other country. Greece holds third place in world olive production with more than 132 million trees, which produce approximately 350,000 tons of olive oil annually, of which 82% is extra-virgin (see below for an explanation of terms). About half of the annual Greek olive oil production is exported, but only some 5% of this reflects the origin of the bottled product . Greece exports mainly to European Union (EU) countries, principally Italy, which receives about three-quarters of total exports. Olives are grown for oil in Greece, with Peloponnese being the source of 65% of Greek production, as well as in Crete , the Aegean Islands and Ionian Islands . The most prized Greek olive variety for oil production is the Korōnéiki, originating from the area of Korōnē in Messenia . This variety grows well on mountain slopes and produces very small fruit; the high ratio of skin to flesh giving the oil its coveted aromatic qualities. The variety is also suited to the production of agourélaio, oil from olives that are slightly unripe. When crushed in presses that are not capable of grinding the stone, this oil is entirely free of acidity and possesses top-tier organoleptic characteristics. Because not crushing the stones reduces oil yield, production of agourélaio is limited to "boutique" presses run by entrepreneurs and small cooperatives. In North America, Italian and Spanish olive oils are the best-known, and top-quality extra-virgin oils from Italy, Spain, Croatia and Greece are sold at high prices, often in "prestige" packaging. A large part of US olive oil imports come from Italy, Spain, and Turkey. The US imported of olive oil in 1998, of which came from Italy. The International Olive Oil Council (IOOC) is an intergovernmental organization based in Madrid , Spain , with 23 member states. It promotes olive oil around the world by tracking production, defining quality standards, and monitoring authenticity. More than 85% of the world's olives are grown in IOOC member nations. The United States is not a member of the IOOC, and the US Department of Agriculture does not legally recognize its classifications (such as extra-virgin olive oil). The USDA uses a different system, which it defined in 1948 before the IOOC existed. The California Olive Oil Council, a private trade group, is petitioning the USDA to adopt IOOC rules. US Customs regulations on "country of origin" state that if a non-origin nation is shown on the label, then the real origin must be shown on the same side of the label and in comparable size letters so as not to mislead the consumer. Yet most major US brands continue to put “imported from Italy” on the front label in large letters and other origins on the back in very small print. These products are a mixture of olive oil from more than one nation and it is not clear what percentage of the olive oil is really of Italian origin. This practice makes it difficult for high quality, lower cost producers outside of Italy to enter the US market, and for genuine Italian producers to compete. An article by Tom Mueller in the August 13, 2007 issue of the The New Yorker alleges that regulation, particularly in Italy, is extremely lax and corrupt. Mueller states that major Italian shippers routinely adulterate olive oil and that only about 40% of olive oil sold as "extra virgin" actually meets the specification. In some cases, colza oil with added color and flavor has been labeled and sold as olive oil. This extensive fraud prompted the Italian government to mandate a new labeling law in 2007 for companies selling olive oil, under which every bottle of Italian olive oil would have to declare the farm and press on which it was produced, as well as display a precise breakdown of the oils used, for blended oils. In February 2008, however, EU officials took issue with the new law, stating that under EU rules such labeling should be voluntary rather than compulsory. Under EU rules, olive oil may be sold as Italian even if it only contains a small amount of Italian oil. In March 2008, 400 Italian police officers conducted "Operation Golden Oil," arresting 23 people and confiscating 85 farms after an investigation revealed a large-scale scheme to relabel oils from other Mediterranean nations as Italian. In April 2008, another operation impounded seven olive oil plants and arrested 40 people in nine provinces of northern and southern Italy for adding chlorophyll to sunflower and soybean oil and selling it as extra virgin olive oil, both in Italy and abroad. 25,000 liters of the fake oil were seized and prevented from being exported. In countries which adhere to the standards of the IOOC the labels in stores show an oil's grade. The US is not a member. Lampante oil is olive oil not suitable as food; lampante comes from olive oil's long-standing use in oil-burning lamps. Lampante oil is mostly used in the industrial market. Refined olive oil is the olive oil obtained from virgin olive oils by refining methods which do not lead to alterations in the initial glyceridic structure. It has a free acidity, expressed as oleic acid, of not more than 0.3 grams per 100 grams (0.3%) and its other characteristics correspond to those fixed for this category in this standard. This is obtained by refining virgin olive oils which have a high acidity level and/or organoleptic defects which are eliminated after refining. Over 50% of the oil produced in the Mediterranean area is of such poor quality that it must be refined to produce an edible product. Note that no solvents have been used to extract the oil but it has been refined with the use of charcoal and other chemical and physical filters. An obsolete equivalent is "pure olive oil"
As the United States is not a member, the IOOC retail grades have no legal meaning in that country; terms such as "extra virgin" may be used without legal restrictions. U.S. Grade D or U.S. Substandard possesses a free fatty acid content greater than 3.0% and "fails to meet the requirements of U.S. Grade C". Greece has by far the largest per capita consumption of olive oil worldwide, over 26 liters per year; Spain and Italy , around 14 l; Tunisia , Portugal and Lebanon , around 8 l. Northern Europe and North America consume far less, around 0.7 l, but the consumption of olive oil outside its home territory has been rising steadily. Sometimes the produced oil will be filtered to eliminate remaining solid particles that may reduce the shelf life of the product. Labels may indicate the fact that the oil has not been filtered, suggesting a different taste. Unfiltered fresh olive oil that has a slightly cloudy appearance is called cloudy olive oil. This form of olive that was popular only amongst olive oil small scale producers is now becoming "trendy" in line with consumer's demand for more ecological and less-processed "green" products. The remaining paste (pomace) still contains a small quantity (about 2-6%) of oil that cannot be extracted by further pressing but only with chemical solvents. This is done in specialised chemical plants, not in the oil mills. The resulting oil is not "virgin" but "pomace oil".The sometimes found term "first press" is technically meaningless as there is no "second" press. Olive oil contains a group of related natural products with potent antioxidant properties which give extra-virgin unprocessed olive oil its bitter and pungent taste and which are esters of tyrosol and hydroxytyrosol, including oleocanthal and oleuropein. But some clinical evidence suggests that it is olive oil's phenolic content, rather than its fatty acid profile, that is responsible for at least some of its cardioprotective benefits. For example, a clinical trial published in 2005 compared the effects of different types of olive oil on arterial elasticity. Test subjects were given a serving of 60 g of white bread and 40 ml of olive oil each morning for two consecutive days. The study was conducted in two stages. During the first stage, the subjects received polyphenol-rich oil (extra virgin oil contains the highest amount of polyphenol antioxidants). During the second phase, they received oil with only one fifth the phenolic content. The elasticity of the arterial walls of each subject was measured using a pressure sleeve and a Doppler laser. It was discovered that after the subjects had consumed olive oil high in polyphenol antioxidants, they exhibited increased arterial elasticity, while after the consumption of olive oil containing fewer polyphenols, they displayed no significant change in arterial elasticity. It is theorized that, in the long term, increased elasticity of arterial walls reduces vascular stress and consequentially the risk of two common causes of death—heart attacks and stroke. This could, at least in part, explain the lower incidence of both diseases in regions where olive oil and olives are consumed on a daily basis. Preliminary research indicates that olive oil could possibly be a chemopreventive agent for peptic ulcer or gastric cancer, but confirmation requires further in vivo study. "New Potential Health Benefit Of Olive Oil For Peptic Ulcer Disease." ScienceDaily 14 February 2007 Olive oil was also found to reduce oxidative damage to DNA and RNA, which may be a factor in preventing cancer. A high consumption of omega-6 polyunsaturated fatty acids, which are found in most types of vegetable oil including olive oil, may increase the likelihood that postmenopausal women may develop breast cancer. Similar effect was observed on prostate cancer. Other analysis suggested an inverse association between total polyunsaturated fatty acids and breast cancer risk. The higher the temperature to which the olive oil is heated, the more one should prefer the use of refined olive oils. When extra-virgin olive oil is heated above , the unrefined particles within the oil get burned. This leads to deteriorated taste and even toxicity . Also, the pronounced taste of extra-virgin olive oil is not a taste most people like to associate with their deep fried foods. Refined olive oils are perfectly suited for deep frying foods and should be replaced after several uses. .
An important issue which is often not realized in countries that do not produce olive oil is that the freshness makes a big difference. A very fresh oil, as available in an oil producing region, tastes noticeably different from the older oils available elsewhere. In time, oils deteriorate and become stale. One-year old oil may be still pleasant to the taste, but it is surely less fragrant than fresh oil. After the first year olive oil should be used for cooking, not for foods to be eaten cold, like salads. Olive oil can be used as an effective shaving oil to shave facial and other body hair giving results that are equivalent to expensive commercial products. Olive oil is unlikely to cause allergic reactions, and as such is used in preparations for lipophilic drug ingredients. It does have demulcent properties, and mild laxative properties, acting as a stool softener. It is also used at room temperature as an ear wax softener.Olive oil is also a potent blocker of intestinal contractions, and can be used to treat excessive Borborygmus. It also makes an excellent lubricant, and can be used in place of machine oil. The Manufacture of Oil, drawn and engraved by J.
Amman in the Sixteenth Century. The olive tree is native to the Mediterranean basin; wild olives were collected by Neolithic peoples as early as the 8th millennium BC. 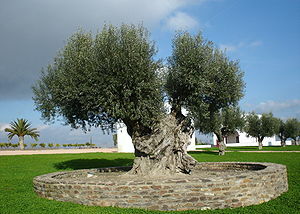 The wild olive tree originated in Asia Minor in modern Turkey . A widespread view exists that the first cultivation took place on the island of Crete . The earliest surviving olive oil amphorae date to 3500 BC (Early Minoan times), though the production of olive is assumed to have started before 4000 BC. An alternative view retains that olives were turned into oil by 4500 BC by Canaanites in present-day Israel . Besides food, olive oil has been used for religious rituals, medicines, as a fuel in oil lamps, soap-making, and skin care application. The importance and antiquity of olive oil can be seen in the fact that the English word oil derives from c. 1175, olive oil, from Anglo-Fr. and O.N.Fr. olie, from O.Fr. oile (12c., Mod.Fr. huile), from L. oleum "oil, olive oil" (cf. It. olio), from Gk. elaion "olive tree", which may have been borrowed through trade networks from the Semitic Phoenician use of el'yon meaning "superior", probably in recognized comparison to other vegetable or animal fats available at the time. Olive trees and oil production in the Eastern Mediterranean can be traced to archives of the ancient city-state Ebla (2600–2240 BC), which were located on the outskirts of the Syrian city Aleppo . Here some dozen documents dated 2400 BC describe lands of the king and the queen. These belonged to a library of clay tablets perfectly preserved by having been baked in the fire that destroyed the palace. A later source is the frequent mentions of oil in Tanakh. Dynastic Egyptians before 2000 BC imported olive oil from Crete, Syria and Canaan and oil was an important item of commerce and wealth. Remains of olive oil have been found in jugs over 4,000 years old in a tomb on the island of Naxos in the Aegean Sea . Sinuhe, the Egyptian exile who lived in northern Canaan about 1960 BC, wrote of abundant olive trees. Until 1500 BC, the eastern coastal areas of the Mediterranean were most heavily cultivated. Olive trees were certainly cultivated by the Late Minoan period (1500 BC) in Crete, and perhaps as early as the Early Minoan. The cultivation of olive trees in Crete became particularly intense in the post-palatial period and played an important role in the island's economy. The Minoans used olive oil in religious ceremonies. The oil became a principal product of the Minoan civilization, where it is thought to have represented wealth. The Minoans put the pulp into settling tanks and, when the oil had risen to the top, drained the water from the bottom. . Olive tree growing reached Iberia and Etruscan cities well before the 8th century BC through trade with the Phoenicians and Carthage , then spread into Southern Gaul by the Celtic tribes during the 7th century BC. Olive trees were planted in the entire Mediterranean basin during evolution of the Roman republic and empire. According to the historian Pliny, Italy had "excellent olive oil at reasonable prices" by the first century AD, "the best in the Mediterranean", he maintained, a claim probably disputed by many ancient olive growers. Thus olive oil was very common in Hellene and Latin cuisine. According to legend, the city of Athens obtained its name because Athenians considered olive oil essential, preferring the offering of the goddess Athena (an olive tree) over the offering of Poseidon (a spring of salt water gushing out of a cliff). Olive oil also has religious symbolism for healing and strength and to consecration—God's setting a person or place apart for special work. This may be related to its ancient use as a medicinal agent and for cleansing athletes by slathering them in oil then scraping them. In Jewish observance, olive oil is the only fuel allowed to be used in the seven-branched Menorah (not a candelabrum since the use of candles was not allowed) in the Mishkan service during the Exodus of the tribes of Israel from Egypt , and later in the permanent Temple in Jerusalem . It was obtained by using only the first drop from a squeezed olive and was consecrated for use only in the Temple by the priests, which is where the expression pure olive oil originates, stored in special containers. A menorah similar to the Menorah used in the Mishkan is now used during the holiday of Hanukkah that celebrates the miracle of the last of such containers being found during the re-dedication of the Temple (163 BC), when its contents lasted for far longer then they were expected to, allowing more time for more oil to be made. Although candles can be used to light the hanukkiah, oil containers are preferred, to imitate the original Menorah. Another use of oil in Jewish religion is for anointing the kings of the Kingdom of Israel, originating from King David. Tzidkiyahu was the last anointed King of Israel. One unusual use of olive oil in the Talmud is for bad breath, by creating a water-oil-salt mouthwash. In Islam, olive oil is mentioned in the Quranic verse: "God is the light of heavens and earth. An example of His light is like a lantern inside which there is a tourch, the tourch is in a glass bulb, the glass bulb is like a bright planet lit by a blessed olive tree, neither Eastern nor Western, its oil almost glows, even without fire touching it, light upon light." The Qur’an also mentions olives as a sacred plant: "By the fig and the olive, and the Mount of Sinai, and this secure city." Olive oil is also reported to have been recommended by the Prophet Muhammad in the following terms: "Consume olive oil and anoint it upon your bodies since it is of the blessed tree." He also stated that it cures 70 diseases. Alan Davidson, The Oxford Companion to Food"', Oxford, 1999. ISBN 0-19-211579-0.